To create my paintings, I specialize in using the latest digital light-based technologies alongside traditional values and techniques. And with the growing commercial success of my own digital art work, I am being asked more and more questions by other artists and collectors about the growing popularity of this fascinating medium which is only just beginning to achieve its true potential as a widely accepted fine art form. Through my commitment to push the boundaries of my own practice and in an attempt to spread the word, I felt it would be valuable for us to take a step back and put the digital art movement into context. At the very heart of the digital art movement is Rex Bruce, the director and founder of LACDA (Los Angeles Center for Digital Art) and one of the few pioneering gallerists exclusively showcasing digital art. In a recent interview with Rex I was able to ask him a set of questions that I hope will form the basis of a series of discussions around the subject. AB- There aren't many galleries that have taken the leap and committed to supporting the digital arts alone. Is where you are based, one of the main factors in your success? RB- I grew up and now work in a very creative and technological community. This environment gave me a very specialized skill set. The social aspect has been incredibly important. My father was a computer programer and I grew up technical. I developed a love of music and with the appearance of analogue synthesizers, I naturally moved into programming. This was way before the invention of Apples and PCs. A master's degree later and it was a series of natural progressions that eventually lead to me creating LACDA, an exhibition space and forum that is dedicated to supporting the digital arts movement. AB- As one of the pioneering gallerists that solely represents digital artists, you must have seen the potential of this medium before it was widely accepted. What was the vision that created LACDA? RB- It was not so much seeing the potential and acting on it but more a very slow process of natural evolution that has needed a great deal of commitment and persistence to ensure it's survival and continued success. No doubt this was supported by the sudden growth in computer technology in the 90s. And the term 'new media' reflected the appearance of Photoshop, the World Wide Web and constant new software advances such as Flash. These all kept the movement going. AB- Were you simply responding to the need for a digital arts forum? RB- Yes. There was a response to the need as new technology became more and more ubiquitous and now the smart phones and tablets with imbedded image editing software are common place. LACDA has become a logical response to the growing need for a forum in the digital arts but it's been the increasing number of academics, curators and artists participating in our virtual community that have also kept the movement alive. The ability to exchange ideas and communicate on a global level has played a central part in our continued success. AB- What would you say to the argument that digital art can still be perceived as being artificial, suggesting its not a real or genuine fine art form. There's a suggestion here that it may have lost the aura of an original oil painting, print or sculpture that can be made and experienced in a real time and place as apposed to a virtual environment. RB- There's probably a juncture at which every new form of art was asked a similar question. The obvious one is when photography came out, it was many years before it made it into a gallery and now its a fully accepted. It's interesting that the word artificial contains the word art. The word art itself implies artifice which in it's origin is linked to 'workmanship' and 'making'. The implication of the language, if one looks closely and conceptualizes, is that all art is art-ifi-cial. Incidentally the word technology comes from techne, a word also linked to craft. So art and technology are a very unified thing and one does not happen without the other. I don't make a distinction between forms that may be considered historic in appearance or labelled as new media. AB- That's a great way of looking at it. The way art is exhibited, has always evolved with the times. The way of exhibiting digital art online or in its virtual environment has often been questioned. Have general preconceptions on the validity of this medium changed? RB- We're talking a lot about how people perceive things. Sure it's valid to exhibit art online. Sure it's valid to put your own art gallery online and sign it RB (haha). Valid is in the eyes of the beholder. I think that if something is markedly different than things that preceded it, then people naturally get a bit flummoxed by it and that's alright. But that can easily turn into a kind of prejudice in the wrong mental hands so to speak. Hypertext, for example, is now taken for granted and fully integrated into the way we communicate. When I first used it there was no internet or anything like that. It definitely was disorientating and anxiety producing. Those kind of feelings come up and its normal to feel that way. There will always be an adjustment period. But in the end it becomes acceptable. Any of these modes of creation are most definitely part of history and the likes of creation that go back to the beginnings of time. 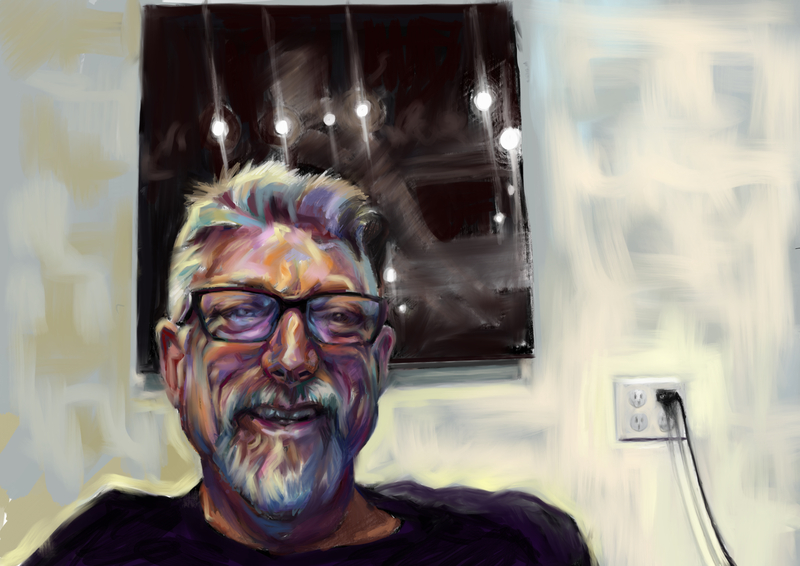 Interested in discovering how I use the iPad to paint? Why not visit my website www.adamjamesbutcher.com to get a sneak peak at my latest digital work or connect with me on Instagram.